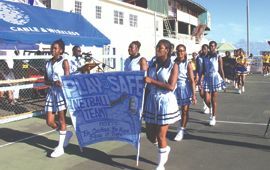 The St. Vincent and the Grenadines Netball Association (SVGNA) will be hoping that the saying âAllâs well thatâs ends wellâ applies to them, as they look to make amends during the remainder of the 2006 Cable & Wireless tournament. The tournament got off to a poor start last Sunday at the Arnos Vale Sports Complex. Several teams chose not to take part in the March Past, further diluting that aspect that once held pride of place. Those who gave prominence to it though were rewarded. âPlay it Safeâ was adjudged the Best Dressed team on parade beating KCCU progressors into second place and Young Strugglers third. Raffles Resort Canouan Islanders took away the Best Banner award, followed by Royâs Inn TRAC and West St. George Secondary School in that order. This yearâs tournament will have thirty-three teams seeking to become champion of one of the five divisions. The usually competitive Division One will see six other teams trying to dethrone C & R Enterprises Sion Hill, to get a crack at the OECS Club championships next year. Sion Hill will carry the torch for the third consecutive year at the sub-regional competition set for May 18 to 21 in Dominica. Division 2A comprises seven teams with Division 2B seeing nine teams going after the prizes up for the taking. Division 3 has six teams and the Under-16, four. Young Ballerz took the Division 3 crown in 2005, as Mitre Sonics secured the Under-16 Division. This year sees eight teams fewer than last yearâs competition as interest in the sport continues to wane. Apart from the trophies, the netballers will vie for places on three representative national teams at regional tournaments in the upcoming months. The OECS Under-23 championship is slated for July 1 to 6 in Grenada, with the Under-16 scheduled for Trinidad and Tobago in November. The senior team heads to Barbados in August for the qualifiers for the World tournament. Fresh from the XVIII Commonwealth Games in Melbourne, Australia last month, where they placed eleventh among the twelve teams, this country will once again will seek a place in another major world netball event. The diehard supporters of netball who made their way to Arnos Vale were taken aback when the national outfit faced a male team in what was dubbed the âfeature matchâ of the afternoon. According to the SVGNA, the match was used to âshow offâ, the teamâs new uniform. Instead, patrons made their way through the gate muttering their disapproval of the new development. This was after two competitive matches grabbed their indulgence. Raffles Resort Canouan Islanders belied their status as newcomers to the national netball scene, beating last yearâs Division 2A champion NCB Valley Netters 28-22. Also perishing on the opening day was defending Division 2B winner Royâs Inn TRAC, who succumbed to the evergreen Vets Sports Club 22-20. The national tournament which has started one month later than usual because of this countryâs netball teamâs participation in the Commonwealth Games is set to end June 24. Cable & Wireless is sponsoring the tournament for the twelfth year. This year sponsorship is valued at EC$11,000.